Musical improvisation (also known as musical extemporization) is the creative activity of immediate ("in the moment") musical composition, which combines performance with communication of emotions and instrumental technique as well as spontaneous response to other musicians. Sometimes musical ideas in improvisation are spontaneous, but may be based on chord changes in classical music and many other kinds of music. One definition is a "performance given extempore without planning or preparation." Another definition is to "play or sing (music) extemporaneously, by inventing variations on a melody or creating new melodies, rhythms and harmonies." Encyclopædia Britannica defines it as "the extemporaneous composition or free performance of a musical passage, usually in a manner conforming to certain stylistic norms but unfettered by the prescriptive features of a specific musical text. Improvisation is often done within (or based on) a pre-existing harmonic framework or chord progression. Improvisation is a major part of some types of 20th-century music, such as blues, jazz, and jazz fusion, in which instrumental performers improvise solos, melody lines and accompaniment parts. Throughout the eras of the Western art music tradition, including the Medieval, Renaissance, Baroque, Classical, and Romantic periods, improvisation was a valued skill. J.S. Bach, Handel, Mozart, Beethoven, Chopin, Liszt, and many other famous composers and musicians were known especially for their improvisational skills. Improvisation might have played an important role in the monophonic period. The earliest treatises on polyphony, such as the Musica enchiriadis (ninth century), indicate that added parts were improvised for centuries before the first notated examples. However, it was only in the fifteenth century that theorists began making a hard distinction between improvised and written music. Some classical music forms contained sections for improvisation, such as the cadenza in solo concertos, or the preludes to some keyboard suites by Bach and Handel, which consist of elaborations of a progression of chords, which performers are to use as the basis for their improvisation. Handel, Scarlatti, and Bach all belonged to a tradition of solo keyboard improvisation, in which they improvised on the harpsichord or pipe organ. In the Baroque era, performers improvised ornaments and basso continuo keyboard players improvised chord voicings based on figured bass notation. However, in the 20th and early 21st century, as "common practice" Western art music performance became institutionalized in symphony orchestras, opera houses and ballets, improvisation has played a smaller role. At the same time, some contemporary composers from the 20th and 21st century have increasingly included improvisation in their creative work. In Indian classical music, improvisation is a core component and an essential criterion of performances. In Indian, Afghani, Pakistani, and Bangladeshi classical music, raga is the "tonal framework for composition and improvisation." The Encyclopædia Britannica defines a raga as "a melodic framework for improvisation and composition. Although melodic improvisation was an important factor in European music from the earliest times, the first detailed information on improvisation technique appears in ninth-century treatises instructing singers on how to add another melody to a pre-existent liturgical chant, in a style called organum. Throughout the Middle Ages and Renaissance, improvised counterpoint over a cantus firmus (a practice found both in church music and in popular dance music) constituted a part of every musician's education, and is regarded as the most important kind of unwritten music before the Baroque period. Following the invention of music printing at the beginning of the sixteenth century, there is more detailed documentation of improvisational practice, in the form of published instruction manuals, mainly in Italy. In addition to improvising counterpoint over a cantus firmus, singers and instrumentalists improvised melodies over ostinato chord patterns, made elaborate embellishments of melodic lines, and invented music extemporaneously without any predetermined schemata. Keyboard players likewise performed extempore, freely formed pieces. Eighteenth-century manuals make it clear that performers on the flute, oboe, violin, and other melodic instruments were expected not only to ornament previously composed pieces, but also spontaneously to improvise preludes. The pattern of chords in many baroque preludes, for example, can be played on keyboard and guitar over a pedal tone or repeated bass notes. Such progressions can be used in many other structures and contexts, and are still found in Mozart, but most preludes begin with the treble supported by a simple bass. J.S. Bach, for example, was particularly fond of the sound produced by the dominant seventh harmony played over, i.e., suspended against, the tonic pedal tone. There is little or no Alberti bass in baroque keyboard music, and instead the accompanying hand supports the moving lines mostly by contrasting them with longer note values, which themselves have a melodic shape and are mostly placed in consonant harmony. This polarity can be reversed—another useful technique for improvisation—by changing the longer note values to the right hand and playing moving lines in the left at intervals—or with moving lines in both hands, occasionally. This shift of roles between treble and bass is another definitive characteristic. Finally, in keeping with this polarity, the kind of question and answer which appears in baroque music has the appearance of fugue or canon. This method was a favorite in compositions by Scarlatti and Handel especially at the beginning of a piece, even when not forming a fugue. According to Encyclopædia Britannica, the "monodic textures that originated about 1600 … were ready-made, indeed in large measure intended, for improvisational enhancement, not only of the treble parts but also, almost by definition, of the bass, which was figured to suggest no more than a minimal chordal outline." Improvised accompaniment over a figured bass was a common practice during the Baroque era, and to some extent the following periods. Improvisation remains a feature of organ playing in some church services and are regularly also performed at concerts. Dietrich Buxtehude and Johann Sebastian Bach were regarded in the Baroque period as highly skilled organ improvisers. During the 20th century, some musicians known as great improvisers such as Marcel Dupré, Pierre Cochereau and Pierre Pincemaille continued this form of music, in the tradition of the French organ school. Maurice Duruflé, a great improviser himself, transcribed improvisations by Louis Vierne and Charles Tournemire. Olivier Latry later wrote his improvisations as a compositions, for example Salve Regina. Classical music departs from baroque style in that sometimes several voices may move together as chords involving both hands, to form brief phrases without any passing tones. Though such motifs were used sparingly by Mozart, they were taken up much more liberally by Beethoven and Schubert. Such chords also appeared to some extent in baroque keyboard music, such as the 3rd movement theme in Bach's Italian Concerto. But at that time such a chord often appeared only in one clef at a time, (or one hand on the keyboard) and did not form the independent phrases found more in later music. Adorno mentions this movement of the Italian Concerto as a more flexible, improvisatory form, in comparison to Mozart, suggesting the gradual diminishment of improvisation well before its decline became obvious. The introductory gesture of "tonic, subdominant, dominant, tonic," however, much like its baroque form, continues to appear at the beginning of high-classical and romantic piano pieces (and much other music) as in Haydn's sonata Hob.16/No. 52 and Beethoven's sonata opus 78. Beethoven and Mozart cultivated mood markings such as con amore, appassionato, cantabile, and expressivo. In fact, it is perhaps because improvisation is spontaneous that it is akin to the communication of love. Beethoven and Mozart left excellent examples of what their improvisations were like, in the sets of variations and the sonatas which they published, and in their written out cadenzas (which illustrate what their improvisations would have sounded like). As a keyboard player, Mozart competed at least once in improvisation, with Muzio Clementi. Beethoven won many tough improvisatory battles over such rivals as Johann Nepomuk Hummel, Daniel Steibelt, and Joseph Woelfl. Extemporization, both in the form of introductions to pieces, and links between pieces, continued to be a feature of keyboard concertising until the early 20th-century. Amongst those who practised such improvisation were Franz Liszt, Felix Mendelssohn, Anton Rubinstein, Paderewski, Percy Grainger and Pachmann. Improvisation in the area of 'art music' seems to have declined with the growth of recording. There is more extensive treatment, essentially about traditional jazz, in Prisms and The Jargon of Authenticity. Improvisation is one of the basic elements that sets jazz apart from other types of music. The unifying moments in improvisation that take place in live performance are understood to encompass the performer, the listener, and the physical space that the performance takes place in. Even if improvisation is also found outside of jazz, it may be that no other music relies so much on the art of "composing in the moment", demanding that every musician rise to a certain level of creativity that may put the performer in touch with his or her unconscious as well as conscious states. The educational use of improvised jazz recordings is widely acknowledged. They offer a clear value as documentation of performances despite their perceived limitations. With these available, generations of jazz musicians are able to implicate styles and influences in their performed new improvisations. Many varied scales and their modes can be used in improvisation. They are often not written down in the process, but they help musicians practice the jazz idiom. A common view of what a jazz soloist does could be expressed thus: as the harmonies go by, he selects notes from each chord, out of which he fashions a melody. He is free to embellish by means of passing and neighbor tones, and he may add extensions to the chords, but at all times a good improviser must follow the changes. 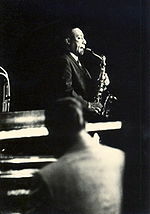 ... [However], a jazz musician really has several options: he may reflect the chord progression exactly, he may "skim over" the progression and simply elaborate the background harmony, or he may fashion his own voice-leading which may clash at some points with the chords the rhythm section is playing. With the notable exception of liturgical improvisation on the organ, the first half of the twentieth century is marked by an almost total absence of actual improvisation in art music. Since the 1950s, some contemporary composers have placed fewer restrictions on the improvising performer, using techniques such as vague notation (for example, indicating only that a certain number of notes must sound within a defined period of time). New Music ensembles formed around improvisation were founded, such as the Scratch Orchestra in England; Musica Elettronica Viva in Italy; Lukas Foss Improvisation Chamber Ensemble at the University of California, Los Angeles; Larry Austin's New Music Ensemble at the University of California, Davis; the ONCE Group at Ann Arbor; the Sonic Arts Group; and Sonics, the latter three funding themselves through concerts, tours, and grants. Significant pieces include Foss Time Cycles (1960) and Echoi (1963). Other composers working with improvisation include Richard Barrett, Benjamin Boretz, Pierre Boulez, Joseph Brent, Sylvano Bussotti, Cornelius Cardew, Jani Christou, Douglas J. Cuomo, Alvin Curran, Stuart Dempster, Hugh Davies, Karlheinz Essl, Mohammed Fairouz, Rolf Gehlhaar, Vinko Globokar, Richard Grayson, Hans-Joachim Hespos, Barton McLean, Priscilla McLean, Stephen Nachmanovitch, Pauline Oliveros, Henri Pousseur, Todd Reynolds, Terry Riley, Frederic Rzewski, Saman Samadi, William O. Smith, Manfred Stahnke, Karlheinz Stockhausen, Toru Takemitsu, Richard Teitelbaum, Vangelis, Michael Vetter, Christian Wolff, Iannis Xenakis, Yitzhak Yedid, La Monte Young, Frank Zappa, Hans Zender, and John Zorn. British and American psychedelic rock acts of the 1960s and 1970s used improvisations to express themselves in a musical language. The progressive rock genre also began exploring improvisation as a musical expression, e.g. Henry Cow. In the realm of silent film-music performance, there were musicians (theatre organ players and piano players) whose improvised performances accompanying these film has been recognized as exceptional by critics, scholars, and audiences alike. Neil Brand was a composer who also performed improvisationally. Brand, along with Guenter A. Buchwald, Philip Carli, Stephen Horne, Donald Sosin, John Sweeney, and Gabriel Thibaudeau, all performed at the annual conference on silent film in Pordenone, Italy, "Le Giornate del Cinema Muto." In improvising for silent film, performers have to play music that matches the mood, style and pacing of the films they accompany. In some cases, musicians had to accompany films at first sight, without preparation. Improvisers needed to know a wide range of musical styles and have the stamina to play for sequences of films which occasionally ran over three hours. In addition to the performances, some pianists also taught master classes for those who wanted to develop their skill in improvising for films. When talkies–motion pictures with sound–were introduced, these talented improvising musicians had to find other jobs. In the 2010s, there are a small number of film societies which present vintage silent films, using live improvising musicians to accompany the film. Worldwide there are many venues dedicated to supporting live improvisation. In Melbourne since 1998, the Make It Up Club (held every Tuesday evening at Bar Open on Brunswick Street, Melbourne) has been presenting a weekly concert series dedicated to promoting avant-garde improvised music and sound performance of the highest conceptual and performative standards (regardless of idiom, genre, or instrumentation). The Make It Up Club has become an institution in Australian improvised music and consistently features artists from all over the world. A number of approaches to teaching improvisation have emerged in jazz pedagogy, popular music pedagogy, the Dalcroze method, Orff-Schulwerk, and Satis Coleman's creative music. Current research in music education includes investigating how often improvisation is taught, how confident music majors and teachers are at teaching improvisation, neuroscience and psychological aspects of improvisation, and free-improvisation as a pedagogical approach. A raga is one of the melodic modes used in Indian classical music. Joep Bor of the Rotterdam Conservatory of Music has defined Raga as "tonal framework for composition and improvisation." Nazir Jairazbhoy, chairman of UCLA's department of ethnomusicology, characterized ragas as separated by scale, line of ascent and descent, transilience, emphasized notes and register, and intonation and ornaments. A raga uses a series of five or more musical notes upon which a melody is constructed. However, the way the notes are approached and rendered in musical phrases and the mood they convey are more important in defining a raga than the notes themselves. In the Indian musical tradition, rāgas are associated with different times of the day, or with seasons. Indian classical music is always set in a rāga. Non-classical music such as popular Indian film songs and ghazals sometimes use rāgas in their compositions. According to Encyclopædia Britannica, a raga, also spelled rag (in northern India) or ragam (in southern India), (from Sanskrit, meaning "colour" or "passion"), in the classical music of India, Bangladesh, and Pakistan" is "a melodic framework for improvisation and composition. A raga is based on a scale with a given set of notes, a typical order in which they appear in melodies, and characteristic musical motifs. The basic components of a raga can be written down in the form of a scale (in some cases differing in ascent and descent). By using only these notes, by emphasizing certain degrees of the scale, and by going from note to note in ways characteristic to the raga, the performer sets out to create a mood or atmosphere (rasa) that is unique to the raga in question. There are several hundred ragas in present use, and thousands are possible in theory." Alapa (Sanskrit: "conversation") are "improvised melody structures that reveal the musical characteristics of a raga." "Alapa ordinarily constitutes the first section of the performance of a raga. Vocal or instrumental, it is accompanied by a drone (sustained-tone) instrument and often also by a melodic instrument that repeats the soloist's phrases after a lag of a few seconds. The principal portion of alapa is not metric but rhythmically free; in Hindustani music it moves gradually to a section known as jor, which uses a rhythmic pulse though no tala (metric cycle). The performer of the alapa gradually introduces the essential notes and melodic turns of the raga to be performed. Only when the soloist is satisfied that he has set forth the full range of melodic possibilities of the raga and has established its unique mood and personality will he proceed, without interruption, to the metrically organized section of the piece. If a drummer is present, as is usual in formal concert, his first beats serve as a signal to the listener that the alapa is concluded." ^ a b Gorow 2002, 212. ^ "Improvise - definition of improvise by The Free Dictionary". Thefreedictionary.com. Retrieved 2017-12-26. ^ a b Horsley 2001. ^ a b Rao, Suvarnalata; Van der Meer, Wim; Harvey, Jane (2002). Bor, Joep, ed. The raga guide : a survey of 74 Hindustani ragas. Monmouth: Wystone Estate. p. 181. ISBN 0-9543976-0-6. ^ a b c Nettl, Bruno. "Raga | Indian musical genre". Britannica.com. Retrieved 2017-12-26. ^ Brown 1976, viii; Fuller 2002. ^ E.g., Ganassi 1535; Ortiz 1553; Dalla Casa 1584. ^ Thomas de Sancta Maria 1565. ^ Collins, Carter, Garden, and Seletsky 2001, (i); Foreman 2001. ^ For example, near the beginning of the Toccata of BWV 565. Bach's Cantata BWV 54 also uses this suspension as the opening chord in E-flat Major. ^ Editors, The. "Improvisation | music". Britannica.com. Retrieved 2017-12-26. ^ a b Adorno 1997, 99–100: "For artworks are things in space and time; whether this holds for hybrid musical forms such as improvisation, once extinct and now resuscitated, is hard to decide; in artworks the element that precedes their fixation as things constantly breaks through the thing-character. Yet even in improvisation much speaks for their status as a thing: their appearance in empirical time and, even more important, the fact that they demonstrate objectivated, mostly conventional patterns. For insofar as art works are works they are things in themselves, objectified by virtue of their particular law of form." ^ Savage, S.(2011). Bytes and Backbeats- Repurposing Music in the Digital Age. The University of Michigan Press. p.116. ^ Savage, S.(2011).Bytes and Backbeats- Repurposing Music in the Digital Age. The University of Michigan Press. p.118. ^ Von Gunden 1983, 32. ^ O'Brien, Lucy M. "Psychedelic rock | music". Britannica.com. Retrieved 2017-12-26. ^ Boisen, Myles. "Henry Cow". AllMusic. Retrieved 28 September 2018. ^ Altman, Rick. Silent Film Sound. ^ Kobel, Peter. Silent Movies: The Birth of Film and the Triumph of Movie Culture. ^ "Composition and Improvisation in Instrumental Methods Courses: Instrumental Music Teacher Educators' Perspectives," Bulletin of the Council for Research in Music Education 205, 2015. ^ "A national survey of music education majors’ confidence in teaching improvisation," International Journal of Music Education 34, no. 4, 2015. ^ "The Neuroscience of Improvisation," Music Educators Journal 103, no. 3, 2017. ^ "The effects of group free improvisation instruction on improvisation achievement and improvisation confidence," Music Education Research 18, no. 2, 2016. ^ Jairazbhoy, Nazir Ali (1995). The Rāgs of North Indian music. Popular Prakashan. p. 45. ISBN 81-7154-395-2. ^ Editors, The. "Alapa | Indian music". Britannica.com. Retrieved 2017-12-26. Abert, Hermann. 2007. W. A. Mozart, translated from the German by Stewart Spencer, edited by Cliff Eisen. New Haven: Yale University Press. ISBN 978-0-300-07223-5. Adorno, Theodor W. 1973. The Jargon of Authenticity, translated by Knut Tarnowski and Frederic Will. Evanston, Ill.: Northwestern University Press. ISBN 0-8101-0407-5. Adorno, Theodor W. 1981. Prisms, translated from the German by Samuel and Shierry Weber. Studies in Contemporary German Social Thought. Cambridge, Mass. : MIT Press. ISBN 0-262-51025-1 ISBN 026201064X. Adorno, Theodor W. 1997. Aesthetic Theory, translated by Robert Hullot-Kentor. Minneapolis: University of Minnesota Press. ISBN 0-8166-1799-6. Brown, Howard Mayer. 1976. Embellishing Sixteenth-Century Music. Early Music Series 1. London: Oxford University Press. ISBN 0-19-323175-1. Collins, Michael, Stewart A. Carter, Greer Garden, and Robert E. Seletsky. 2001. "Improvisation II: Western Art Music 3: The Baroque Period". The New Grove Dictionary of Music and Musicians, second edition, edited by Stanley Sadie and John Tyrrell. London: Macmillan Publishers. Dalla Casa, Girolamo. 1584. Il vero modo di diminuir, con tutte le sorti di stromenti di fiato, & corda, & di voce humana. 2 vols. Venice: Angelo Gardano. Facsimile reprint, in one volume, Bibliotheca musica Bononiensis, sezione 2, no. 23 (Bologna: Arnoldi Forni Editore). Foreman, Edward. 2001. Late Renaissance Singing: Giovanni Camillo Maffei, Discourse on the Voice and the Method of Learning to Sing Ornamentation, without a Teacher (1562); Lodovico Zacconi, The Practice of Music, book one, chapters LVIII-LXXX (1592); Giovanni Battista Bovicelli, Rules, Passages of Music (1594); Giovanni Luca Conforto, Brief and Easy Method ... (1603?) with English translation, [s.l. ]: Pro Music Press. Fuller, Sarah. 2002. "Organum, Discantus, Contrapunctus in the Middle Ages". In The Cambridge History of Western Music Theory, edited by Thomas Christensen, 477–502. Cambridge: Cambridge University Press. ISBN 0-521-62371-5. Ganassi, Silvestro. 1535. Opera Intitulata Fontegara: Laquale insegna a sonare di flauto ch'o tutta l'arte opportuna a esso instrumento massime il diminuire ilquale sara utile ad ogni istrumeno di fiato et chorde: et anchora a chi si dileta di canto. Venice: per Syluestro di Ganassi dal Fontego, Sonator dalla illustrissima signoria di Venetia hautor pprio. Facsimile reprints, Collezione di trattati e musiche antiche edite in fac-simile (Milan: Bollettino bibliografico musicale, 1934) and Bibliotheca musica Bononiensis, Sezione II, no. 18 (Bologna: Forni, 1969). German edition, translated and edited by Hildemarie Peter (Berlin-Lichterfeld: Robert Lienau, 1956). English edition with translation by Dorothy Swainson of Peter's German text (Berlin-Lichterfeld: Robert Lienau, 1959). Gorow, Ron. 2002. Hearing and Writing Music: Professional Training for Today's Musician, 2nd ed. Gardena, CA: September Publishing. ISBN 0-9629496-7-1. Griffiths, Paul. 2001. "Improvisation §II: Western Art Music 6: The 20th Century". The New Grove Dictionary of Music and Musicians, ed. S. Sadie and J. Tyrrell. London: Macmillan. Hamilton, Kenneth. 2008. After the Golden Age: Romantic Pianism and Modern Performance. Oxford and New York: Oxford University Press ISBN 978-0-195-17826-5. Horsley, Imogene. 2001. "Improvisation II: Western Art Music 2: History to 1600". The New Grove Dictionary of Music and Musicians, second edition, edited by Stanley Sadie and John Tyrrell. London: Macmillan Publishers. Hotteterre, Jacques-Martin. 1719. L’art de préluder: sur la flûte traversière, sur la flûte à bec, sur le hautbois et autres instrumens de dessus, op. 7. Paris: Boivin. Facsimile reprints: recueillie par Michel Sanvoisin (Paris: A. Zurfluh, 1966), (Geneva: Minkoff, 1978) ISBN 2-8266-0672-7, and Archivum musicum: L’art de la flûte traversière 55 (Florence: SPES, 1999). ISBN 88-7242-779-7 Musical pieces edited by Erich Doflein and Nikolaus Delius as 48 Préludes in 24 Tonarten aus op. VII, 1719, für Altblockflöte (Querflöte, Oboe). Mainz: B. Schott’s Söhne; New York: Schott Music Corp., 1972. Ortiz, Diego. 1553. Trattado de glosas sobre clausulas y otros generos depuntos en la musica de violones. Nuevamente puestos en Luz (also in Italian, as El primo libro nel quale si tratta delle glose sopra le cadenze et altre sorte de punti in la musica del violone). 2 vols. Rome: Dorico. Facsimile reprint of the Italian edition, Archivum musicum 57 (Florence: Studio per edizioni scelte, 1984). Transcription, edition, and German translation by Max Schneider (Kassel: Bärenreiter, 1936). Solomon, Maynard. 1998. Beethoven, second, revised edition. New York: Schirmer Books; London: Prentice Hall International. ISBN 0-02-864717-3. Second printing, 2001, ISBN 0-8256-7268-6. Szwed, John F. 2000. Jazz 101: A Complete Guide to Learning and Loving Jazz. New York: Hyperion. ISBN 0-7868-8496-7. Von Gunden, Heidi. 1983. The Music of Pauline Oliveros. Metuchen, NJ: Scarecrow Press. ISBN 0-8108-1600-8. Winkler, Peter (1978). "Toward a Theory of Pop Harmony". In Theory Only. 4 (2): 3–26. Alperson, Philip. 1984. "On Musical Improvisation". The Journal of Aesthetics and Art Criticism 43, no. 1 (Fall): 17–29. Bailey, Derek. 1992. Improvisation: Its Nature and Practice in Music, revised edition. London: British Library National Sound Archive. ISBN 0-7123-0506-8. Berliner, Paul. 1994. Thinking in Jazz: The Infinite Art of Improvisation. Chicago: University of Chicago Press. ISBN 0-226-04380-0 (cloth); ISBN 0-226-04381-9 (pbk). Crutchfield, Will. 2001. "Improvisation: II. Western Art Music: 5. The Nineteenth Century: (ii) Vocal music". The New Grove Dictionary of Music and Musicians, second edition, edited by Stanley Sadie and John Tyrrell. London: Macmillan Publishers. Czerny, Carl. 1833. L’art de préluder: mis en pratique pour le piano par 120 examples de préludes, modulations, cadenses et fantaisien de tous genres. Paris: M. Schlesinger. Duckles, Vincent (1957). "Florid Embellishment in English Song of the Late 16th and Early 17th Centuries". Annales musicologiques. 5: 329–45. Ferand, Ernest T. 1938. Die Improvisation in der Musik; eine Entwicklungsgeschichtliche und Psychologische Untersuchung. Zürich: Rhein-Verlag. Ferand, Ernest T. (1956). "Improvised Vocal Counterpoint in the Late Renaissance and Early Baroque". Annales Musicologiques. 4: 129–74. Friedrich, Otto. 1989. Glenn Gould: A Life and Variations. New York: Random House. ISBN 0-394-57771-X. Guido d'Arezzo. 1978. "Micrologus" [ca. 1027], translated by Warren Babb. In Hucbald, Guido, and John on Music: Three Medieval Treatises, edited, with introductions, by Claude V. Palisca; index of chants by Alejandro Enrique Planchart, 57–83. Music Theory Translation Series 3. New Haven and London: Yale University Press. ISBN 0-300-02040-6. Hall, Lucy. 2002. "They're Just Making It Up—Whatever Happened to Improvisation in Classical Music?" The Guardian (12 June). Heartz, Daniel. 1958–63. "The Basse Dance, Its Evolution Circa 1450 to 1550". Annales Musicologiques 6:287–340. Kertz-Welzel, Alexandra. 2004. "Piano Improvisation Develops Musicianship." Orff-Echo 37, no. 1:11–14. Koenig, Wolf, and Roman Kroitor (prod./dir.). 1959a. Glenn Gould: Off the Record. Film, 30 mins. [Canada]: National Film Board of Canada. Koenig, Wolf, and Roman Kroitor (prod./dir.). 1959b. Glenn Gould: On the Record. Film, 30 mins. [Canada]: National Film Board of Canada. Kutschke, B. (1999). "Improvisation: An Always-Accessible Instrument of Innovation". Perspectives of New Music. 37 (2): 147–162. JSTOR 833513. Mozart, Wolfgang Amadeus. 1953. Concerto No. 24 In C Minor for Piano, edited by Franz Kullak. New York: G. Schirmer. Nachmanovitch, Stephen. 1990. Free Play: Improvisation in Life and Art. Los Angeles: J.P. Tarcher, Inc.; New York: Distributed by St. Martin's Press. ISBN 0-87477-578-7 (cloth); ISBN 0-87477-631-7 (pbk); New York: G.P. Putnam's Sons. ISBN 0-87477-631-7. Polk, Keith. 1966. "Flemish Wind Bands in the Late Middle Ages: A Study of Improvisatory Instrumental Practices". Ph.D. dissertation. Berkeley: University of California. Schopenhauer, Arthur. 1958. The World as Will and Representation. Translated from the German by E. F. J. Payne, 2 vols. [Indian Hills, Colorado]: Falcon's Wing Press. Sancho-Velazquez, Angeles. 2005. "The Legacy of Genius: Improvisation, Romantic Imagination, and the Western Musical Canon," Ph. D. dissertation, University of California, Los Angeles.